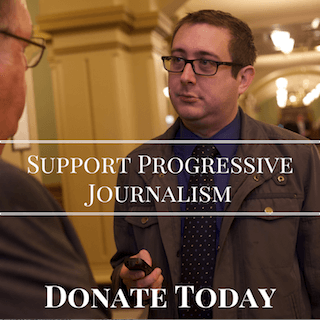 Problems with candidate petitions and signatures is nothing new in Iowa politics, but the recent spate of problems have certainly surpassed past screw-ups. Both 3rd District Democrat Theresa Greenfield and Republican gubernatorial candidate Ron Corbett won’t know until next week whether their candidacies might continue after initial problems with signature collections. And now another 3rd District Democrat, Cindy Axne, is publicly warning Democrats about the consequences of trying to put Greenfield on the ballot. Greenfield has been seeking a legal option all this week after her campaign manager admitting he had forged signatures set off a huge chain of events. The 3rd District Democratic central committee has agreed to hold a meeting on Monday where they’ll vote on whether or not to place Greenfield on the Democratic primary ballot. The legal rationale that the Greenfield campaign is pursuing in this case has to deal with an obscure part of the Iowa Code, section 43.23. That section (posted in full at the end of this article) lays out how a party “may designate one additional primary election candidate for the nomination that person was seeking” in the case of the death or withdrawal of a candidate in a primary a certain number of days before the election takes place. First, her initial affidavit of candidacy, showing she had filed “nomination papers” with the Secretary of State. Second, that her initial signature petitions were received. And third, the paperwork showing that she withdrew her nominating papers. Greenfield had hoped for the Attorney General’s office to weigh in officially on the matter so they would know if her situation would certainly apply to this code. But Tom Miller declined to do so, as did Secretary of State Paul Pate. 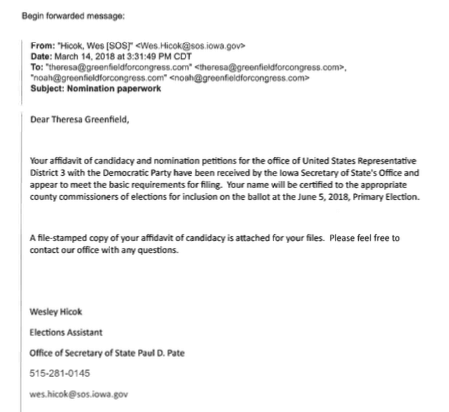 Greenfield’s campaign initially held up some wording from Pate that the office would “receive” her affidavit of candidacy and the Democratic committee’s certification, but Pate’s office pushed back to clarify that. 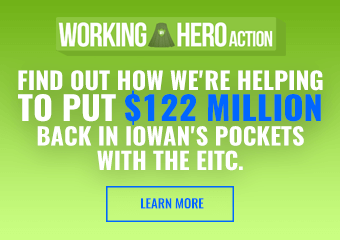 “This office will continue to analyze and research this matter in a careful and thorough manner, but at this time, I will also be reserving judgement on the applicability of Iowa Code section 43.23,” Pate said in a statement. Basically, both Pate and Miller are taking a wait-and-see stance. They and State Auditor Mary Mosiman would be part of a three-person commission who would have to decide on the matter if the 3rd District Democrats vote to put Greenfield on the ballot, and a legal challenge could still be pending in any case. 3rd District Democrats Chair Bill Brauch weighed in with his own legal interpretation of the code earlier this week, which was not favorable to Greenfield’s cause. See the full text of Brauch’s email at the end of this article. Finally, this afternoon, Cindy Axne’s campaign put out a public criticism of Greenfield’s candidacy, urging Democrats to reject Greenfield’s effort to get back on the ballot. Axne’s assertion that Greenfield’s signature gathering was flawed certainly has some merit. 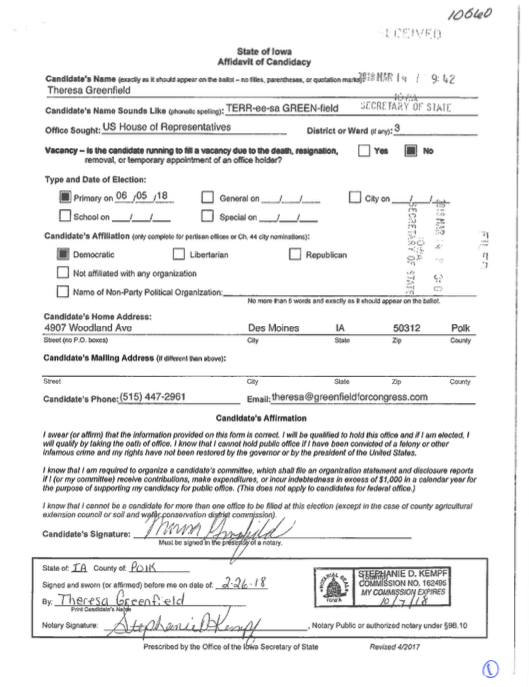 While Greenfield withdrew her initial petitions after her campaign manager admitted to forgeries, she was dangerously close to not making the minimum number required regardless. Starting Line viewed Greenfield’s initial petition submission earlier this week in one of the Secretary of State’s offices. It appears she only had two signatures over the minimum requirement for Adams County, two over for Taylor County, four over in Union County and five over in Page County. It also seems she only had the minimum requirement for exactly eight counties, meaning she would have missed the ballot had just one of those contained just a few duplicates or errors. Most campaigns get double the amount required just to be on the safe side. The problems with Greenfield’s petition effort should probably have been clear to the candidate long before the forgery confession. 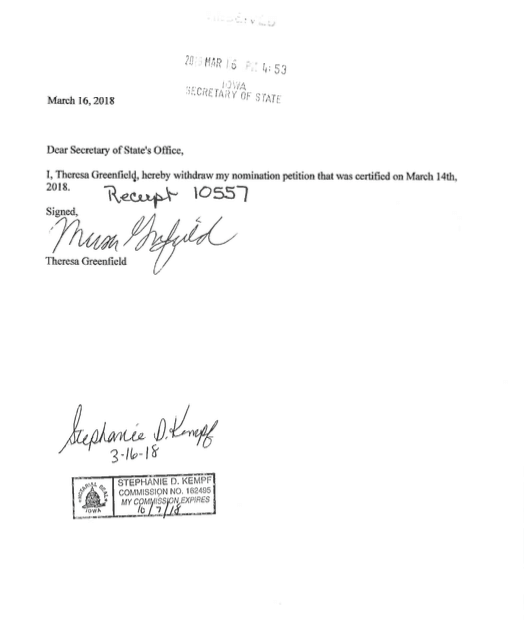 There were also many pages that were dated as March 12 and 13, just before Greenfield filed, that certainly look to have the same hand writing for all the address and date fields. That’s not improper, and it’s hard to tell just how obvious any of the potential signature forgeries are, but overall a few pages did look kind of odd (I won’t post my photos of those here just in case they are actual people’s signatures with their accompanying addresses – it is a public record, but I’d just as soon not upset those folks). The key decision on the matter will come on Monday afternoon when members of the 3rd District Democratic committee get on a phone call to discuss and vote on Greenfield’s request. Even if she does get a favorable decision, Republicans or a fellow Democratic campaign would probably challenge the legality of the move. There does not, however, appear to be any legal liabilities for the Democratic committee, as was earlier feared – just the candidate. 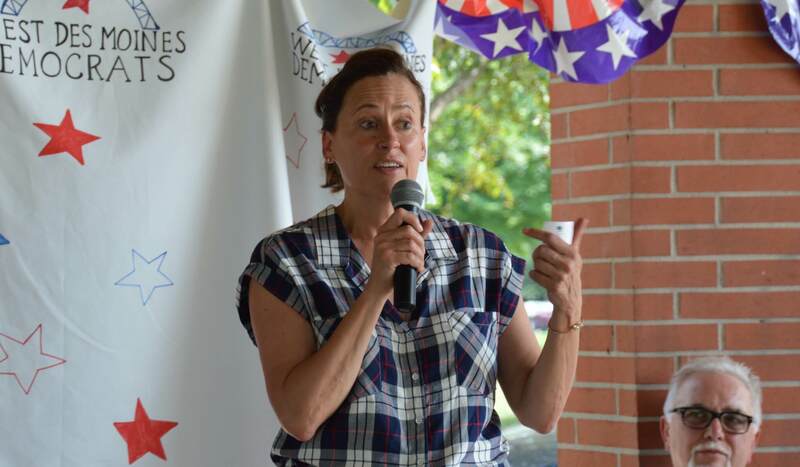 (Des Moines, IA) Today, Democratic Congressional Candidate Cindy Axne released a statement to the members of the 3rd District Democratic Central Committee regarding the extraordinary measures the Theresa Greenfield campaign is asking them to take in order to put her on to the ballot. Cindy Axne said, “Every single day on the campaign trail, I promise Iowa voters that I will never stop fighting when it comes to doing the right thing. It’s what I’ve done throughout my life, and as a candidate for US Congress, that includes my responsibility to ensure we protect our election process and hold those running for office accountable. Anyone running for office should uphold the law, not seek to twist it in their favor. Theresa Greenfield’s circumstance is unfortunate, but the buck stops with the candidate. Despite multiple attempts, she has not qualified for the ballot. I am truly sorry for the position in which she finds herself, but we cannot ignore the integrity of our election process. Legal opinions support the fact that the statute Ms. Greenfield is trying to use simply does not apply in this case. Despite the great personal tragedy of my mom unexpectedly passing away in the middle of petition gathering, I met and exceeded the obligations and earned my place on the ballot. I didn’t shrink from my responsibilities, and neither did my fellow candidates Eddie Mauro and Pete D’Alessandro; each of us, and our campaigns, played by the rules and did the hard work required of us. What is most important is that we – 3rd District Democrats – are in a position to defeat David Young in November and put this seat back in Democratic hands so working families once again have a voice in Washington. This continued turmoil and request for extraordinary measures unsupported by the law are giving Republicans the opportunity to discredit Democrats by invoking backroom deals and ballot fraud. These accusations are harmful to the party and unfair to whoever our eventual nominee is. Rest assured, if the committee yields to Ms. Greenfield’s request, we will be hearing about this well into the fall. I fear this could help hand Republicans the election. 43.23 Death or withdrawal of primary candidate. 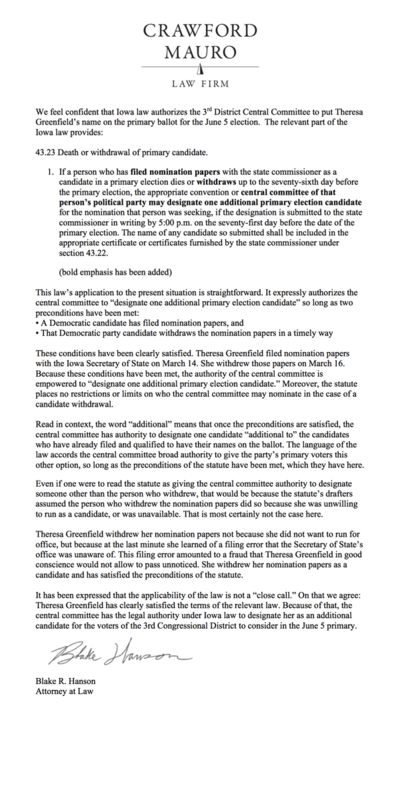 If a person who has filed nomination papers with the state commissioner as a candidate in a primary election dies or withdraws up to the seventy-sixth day before the primary election, the appropriate convention or central committee of that person’s political party may designate one additional primary election candidate for the nomination that person was seeking, if the designation is submitted to the state commissioner in writing by5:00 p.m.on the seventy-first day before the date of the primary election. The name of any candidate so submitted shall be included in the appropriate certificate or certificates furnished by the state commissioner under section 43.22. If a person who has filed nomination papers with the commissioner as a candidate in a primary election dies or withdraws up to the sixty-seventh day before the primary election, the appropriate convention or central committee of that person’s political party may designate one additional primary election candidate for the nomination that person was seeking, if the designation is submitted to the commissioner in writing by5:00 p.m.on the sixty-third day before the primary election. The name of any candidate so submitted shall be placed on the appropriate ballot or ballots by the commissioner. Hi Folks: I wanted to let you know my views on the question of what we decide to do on Monday. First, I will be advocating at tonight’s Executive Committee meeting that we go forward with Monday’s full Central Committee meeting. I think a matter of this import deserves a determination by the full Committee. In addition, please understand that, as is always the case in my 8 years chairing this Committee, I am not supporting any particular candidate, have not contributed any money to any of them, and have not developed any special relationship with any. I would never do that and certainly didn’t do so this time around. I honestly haven’t even decided for whom to vote. As your Chair, it would not be appropriate for me to remain silent on this vital issue, undoubtedly the most important we’ve dealt with these past 8 years. I have given my views on this to others, and therefore, feel an obligation to share them with you. I have always tried to be transparent and I sure will be in this instance. I feel awful about Ms. Greenfield’s situation. She has worked hard and, like our other candidates, seems to be a wonderful person. As you know, I am a lawyer with near 31 years experience writing, interpreting, and enforcing Iowa law. Like any other lawyers in our Central Committee, I have no special expertise in election law. But I can read a statute. The following is not legal advice, nor is it a legal opinion, I am not your lawyer. Rather, it is my view of the applicability of the statute upon which Ms. Greenfield relies in seeking our action to place her on the ballot. To me, whether the statute applies is the threshold issue with which we must deal. If it doesn’t apply, we lack authority to act. We, and only we, can make that call. I shared the following views with Ms. Greenfield this morning. At the bottom of this e-mail is the full text of section 43.23. The language upon which she is relying is subsection 1. For that subsection to apply, (in other words, it’s “trigger”) the party must be facing a situation where a person who has filed nomination papers with the Secretary of State has either passed away or has withdrawn as a candidate. So, the trigger is two-part: 1) Has a candidate withdrawn; and, 2) is that candidate someone who filed nomination papers? (For example, Austin Frerick, Paul Knupp, and Heather Ryan do not qualify as they never filed papers, though they have clearly withdrawn). It is my view that Ms. Greenfield does not qualify under either of those triggers. First, she is not a candidate who has filed nomination papers. Her first set of papers were filed and then pulled back. Her second set were filed but did not qualify for ballot placement for lack of sufficient signatures. We are not facing a situation where someone filed and now can’t go forward for some reason – death or otherwise, and decides to pull out of the race. The law clearly targets situations where a candidate did all she needed to do, is going to be on the ballot, and then, for some reason, dies or withdraws as a candidate so needs to be replaced. That’s not the situation here. Second, in my view she clearly has not withdrawn as a candidate. She continues to promote her campaign and to attempt to raise funds. She is soliciting members of this Committee to vote to place her name on the ballot. She is not proceeding as a “withdrawn” candidate. Chapter 43 does not define “withdraw” and, therefore, I read the term to have its broadest meaning, particularly in light of the purpose of this statute, which is very clear to me. The purpose is to enable political parties to fill ballot vacancies when a primary candidate passes away or otherwise decides not to run. That’s not the case in this situation. Ms. Greenwood has never acted in the manner of a candidate who has withdrawn and is not doing so today. If one could somehow read the statue to be triggered (and, as noted, I don’t think that is a reasonable interpretation of the law), there is a third test. 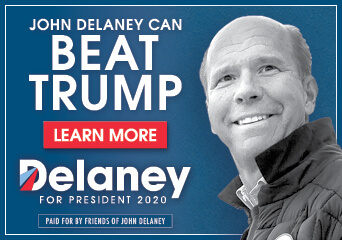 That is whether the language, “may designate one additional primary election candidate for the nomination that person was seeking…” The reference to “that person” means the candidate who died or pulled out of the race. It speaks in the past tense “was seeking.” It does not contemplate that person being the same person who will be placed on the ballot by the Central Committee via this process, as would be the case if we were to vote to place Ms. Greenfield on the ballot. If I thought this was a close call, I would tell you that. I do not think this is a close call. I will be voting on Monday that the statute has not been triggered and that the Central Committee lacks authority to move forward to a second vote as to whether we should place someone’s name on the ballot (it is “someone” in that anyone who qualifies to run for Congress from the Third District would be eligible were the statute to have been triggered). I will not vote to support an action that I believe is not supported by applicable law. In addition, I am concerned about creating a precedent from which we can’t back away in the future. If David Young had a primary opponent, and if Young had failed to get his nomination papers in, where would we stand? I think you know the answer. How I would vote on the second question of who we should support, if we pass a motion to continue to a vote on that question, I will keep to myself for now. I may simply decide not to vote. “Starting Line viewed Greenfield’s initial petition submission earlier this week in one of the Secretary of State’s offices. It appears she only had two signatures over the minimum requirement for Adams County, two over for Taylor County, four over in Union County and five over in Page County. It also seems she only had the minimum requirement for exactly eight counties, meaning she would have missed the ballot had just one of those contained just a few duplicates or errors.